This manual contains a summary of the important cases touching upon every major procedural facet of criminal defense representation. This edition also includes an immigration section that discusses the responsibilities of counsel and the immigration consequences of selected Rhode Island statutes. A CD containing the entire manual in PDF format is available in the back pocket. The first edition of this manual began in 1997 as an effort to summarize and understand the cases I needed to know as a young Public Defender in order to effectively represent my clients. I began with a stack of cases and materials I received from the office veterans and worked from there. 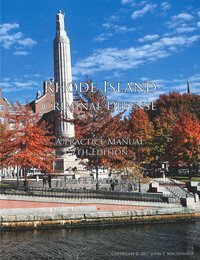 This manual is dedicated to the trial and appellate attorneys of the Rhode Island Public Defender’s Office. They remain the vanguard of zealous criminal defense representation in this state. Call the Attorneys at The Law Offices of John E. MacDonald, Inc. at 401-421-1440 or EMAIL us today. © John E. MacDonald. All Contents Copyright 2004-2011 John E. MacDonald. All Rights Reserved. The contents of all material available on this Internet site www.AggressiveLegalServices.com are copyrighted by John E. MacDonald. ALL RIGHTS RESERVED. All rights are reserved by John E. MacDonald, and content may not be reproduced, downloaded, disseminated, published, or transferred in any form or by any means, except with the prior written permission of John E. MacDonald.